Subvert the Dominant Paradigm of Disability/Charity By Letting Me Match Your Monthly Gift for Those Meddling Advocates at DREDF! Image description: An old-timey drawing from a scene in A Christmas Carol where Bob Cratchit is holding Tiny Tim on his shoulder, who is cheerfully waving his crutch. At the bottom: Dog bless DREDF’s donors – everyone! How I love crafting heartwarming holiday cards. Like Tiny Tim subverting the dominant paradigm of disability/charity. You may not know this, but fundraising is a hotbed of subversion if you’re disabled (like me) and raising money to fight ableism instead of being used as an ableist prop by someone else. You know what goes great with a paradigm shift? A new narrative. If you become a DREDF monthly donor by 1/31/19, I will match your first $40. Ex. : If you give $20 per month, I will match the total of your first 2 months, or $40. I’ll know it’s a match gift because you’ll include “Nothing about Tiny Tim, without Tiny Tim” in the note field of your online gift. You may know me as the Queen of Sardonica or as A Crip in Philanthropy but my days are spent fundraising at DREDF where I’m often serious for up to entire minutes at a time. Our education rights work alone tells you why: “Dickensian” describes schools that lock disabled students in closets, hold them face-down in 4-point restraints, and fail to teach them how to read. Individual contributions are critical because both impact litigation and policy require a big investment of time and resources, and foundation funding for disability advocacy is scarce. I’m a DREDF major donor now because I have complete trust in the integrity, independence, and brilliance that the staff (who are not me) bring to disability civil and human rights advocacy. If you know, like I do, that DREDF has made the world better than it was 40 years ago, please join me in giving a year-end gift. 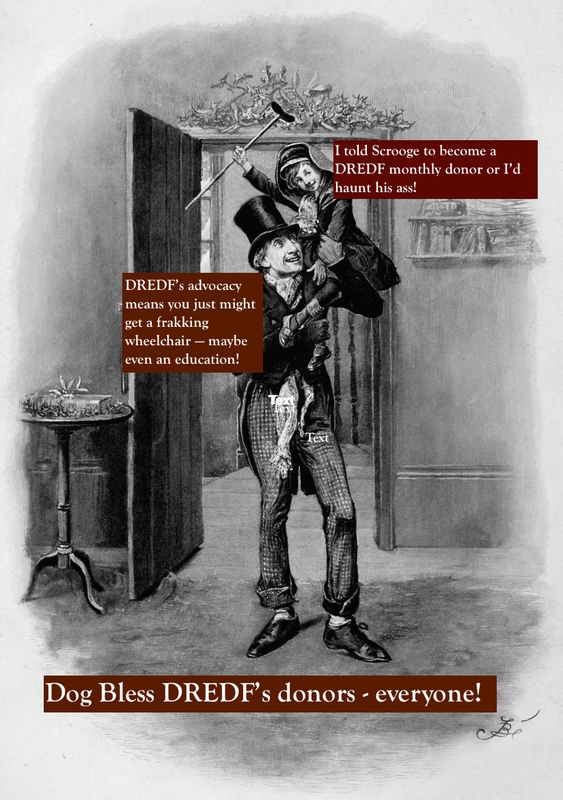 Share DREDF with someone you know. If a monthly thing isn’t for you right now, no problem. We appreciate every single gift that will fuel our 2019 work to defend those gains and – let’s hope – advance them over the next decades. Together!